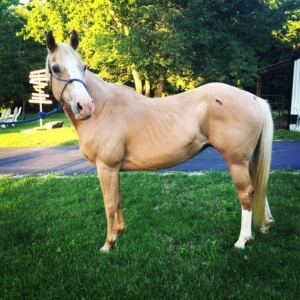 Surprise is a well built, stocky, quarter horse mare. It was said that she had professional western pleasure training as a two year old, but that has been many, many years ago. 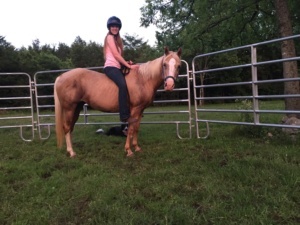 Surprise needs a confident intermediate rider. She walks, trots, and canters well under saddle and has a good whoa and reverse. Surprise rides in a hackamore or bitless bridle. Surprise has been ridden out in an open field to simulate a “trail” ride and was fine. She has also been hauled off site to show and did fabulous, placing 2nd in hunter under saddle and 1st in hunt seat equitation! She is a gorgeous mare and gets along well with the herd. Surprise has some issues with being tied, but we are working with her on that. She works beautifully from the ground with lunging, moving her shoulders, and moving her hind quarters. She is very responsive and never shifts her focus from her handler. Surprise’s adoption fee is only $200!